If you know me you know I'm crazy about The Hunger Games. Never have I been so engrossed in a series and read a book so many times. I've waited and waited for Mockingjay to be released. I asked off work 6 months ago to read it on the day with no distractions. I wanted to know the ending to this trilogy and I had in my mind what I wanted to happen. This book didn't live up to my expectations. Don't hate me! It just didn't. My favorite characters were changed, it was as if I never knew them. There was too much depression, war, and politics. Katniss is a pawn more than ever, and I felt like she had taken a stupid pill or something. Not the strong Katniss that I knew. The ending was rushed, and didn't live up to anything I had hoped. It was as if the author knew what we all wanted and refused to give it to us. I read the book twice, and it was a bit better the second time. But not by much. I'll still love this series. But Mockingjay is better left of the shelf for me. "Finnick?" I say, "Maybe some pants?" He looks down at his legs as if noticing his outfit for the first time. Then he whips off his hospital gown leaving him in just his underwear. "Why? Do you find this"- he strikes a ridiculously provocative pose -"distracting?" I agree with you. 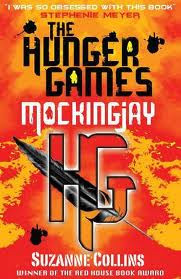 One review I read said she felt Katniss was in a drug induced state the whole book, it's because she was! It was disappointing to me because she left out the romance that might have made the war more bearable. Thanks for the great review and for buying me the book! I agree and have been nervous to say anything. Glad someone agrees. I have some major issues with the book. I mean, I still love the series and respect Ms. Collins. She can write, that's for sure, but this book disappointed me on so many levels. Oh wow, I'm so sorry to hear that you didn't enjoy it! I haven't even started the first book, so I can't relate when you talk about the characters. I'm glad it was a bit better the second time, though! Sad! Sorry you weren't impressed. I was skeptical that I would like the end to this series - it's been so built up, but I actually really did like it. I thought it was a great ending to a wonderfully unique series of books. I love that quote! :) One of the funniest moments of the book. I miss humor in serious books like these. I totally agree. It's so complicated... the whole book I was going, did that really happen? Or is she just drugged and she dreamed of this? WHY DID THEY KILL FINNICK? WHAT DO THEY GAIN BY KILLING FINNICK? !